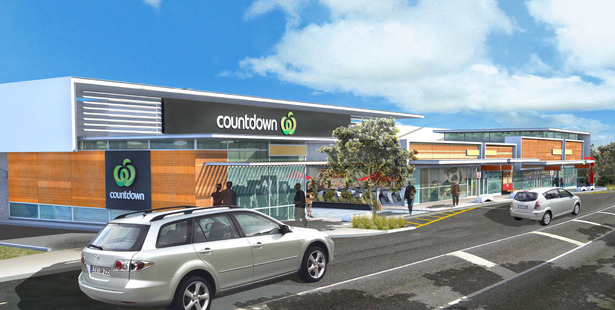 Supermarket giant Countdown has released plans for a new $35 million supermarket for Waiheke Island to replace a small, existing store. Adrian Walker, Countdown's property general manager, said work on the new Ostend site would start this month and the new store would open in the first quarter of 2016. "This is significant news for our Waiheke customers. It's no secret that we've been looking to bring a more modern supermarket offer to the community for many years so we're very excited to now be able to confirm we'll be starting work in just a few weeks," Walker said. The new store will be on Belgium St and very near the current Ostend Rd store which is being replaced. Walker's statement said the new store would be 150 per cent larger than the current store at 3490sq m and would include five to six specialty retail shops along the roadside, and a partially underground car park with 179 car parks. "We've been very open about the challenges we've had that are unique to large construction on the island - the size and nature of our site, the store features required, and the cost to bring over materials and labour support from Auckland. "We needed to find a solution that would stack up both for what the growing community needs and also financially for us to make this investment. We know this has been highly anticipated by the community so we appreciate their patience while we have been working solidly on this in the background," Walker said. Staff numbers will almost double. "The new store is also expected to create 60 jobs, adding to the 73 team at the current store," the statement said. Walker said the existing Countdown was one of the largest businesses and employers on the island. "We're really proud to be able to make this investment which will support local job creation and provide a first class offer to the Waiheke community as well as the large number of visitors to the Island year round," Walker said. In 2013, customers and staff at the Waiheke Countdown escaped a large fire without injury. The occupants of the supermarket and neighbouring Placemakers store were evacuated to a carpark. The blaze, attended by four fire engines, was confined to a 30m by 10m cafeteria, said Northern fire communications spokeswoman Megan Ruru. There was nothing to suggest the fire was suspicious, she said. Countdown spokeswoman Kate Porter said everyone was evacuated without injury.